The Singapore headquartered medtech company has recently raised US$40 million in a record-breaking Series A investment led by Venturecraft shareholders and backed by Gaorong Capital. Ark, a Singapore-based medtech enterprise focused on early cancer detection, has raised a record US$40 million in Series A funding. Ark’s vision is “a world without late-stage cancer” and its mission is to eliminate late-stage cancer related death by 2048 through the introduction of accurate, affordable, and actionable cancer detection technologies. This record-breaking Series A round was led by shareholders of Venturecraft and backed by Gaorong Capital (formerly known as Banyan Capital), one of China’s top 5 venture capital firms with a portfolio of over US$1.7 billion in committed investments. Established as a result of a merger between MiRXES and Venturecraft, Ark is kicking off by launching a blood test for early detection of stomach cancer in Asia. Spun off from A*STAR in 2014, MiRXES had developed a highly sensitive and robust microRNA (miRNA) detection technology and identified novel bloodborne cancer biomarkers that detects early-stage cancer before clinical symptoms appear. Formed in 2014, Singapore-based Venturecraft, who has been investing in global growth-stage and late-stage ventures in MedTech, BioTech, and Digital Health, invested in MiRXES in 2016. Venturecraft has since been actively supporting MiRXES to commercialise and scale its technologies and products. With this latest development, MiRXES combines its R&D, manufacturing and commercialisation capabilities with Venturecraft’s clinical assets and venture financing resources to form Ark, an end-to-end solution provider focused on early cancer detection. The Series A funding will enable Ark to accelerate its internationalisation from Singapore to China and beyond. MiRXES’ founding team and shareholders of Venturecraft will remain as key strategic shareholders of Ark. Cancer is the second leading cause of death worldwide, with 9.6 million deaths in 2018. Cancer statistics show that early detection of cancer will improve patient survival rates from as low as 10% to as high as 90%. Furthermore, 70% of cancer deaths occur in low- and middle-income countries where people have no access to early cancer detection technologies. Ark is targeting this vast population in Asia that is at risk of developing cancer, an estimated US$50 billion market. With its headquarters in Singapore and operations in China as well as the United States, Ark will build up necessary infrastructure, including sales channels and diagnostic laboratories, to reach consumers directly with more affordable early cancer detection solutions. Ark’s first product will be a stomach cancer blood test, developed to detect early stage stomach cancer before symptoms appear. This test was developed in collaboration with the Singapore Gastric Cancer Consortium (SGCC), A*STAR’s Diagnostics Development Hub (DxD hub), National University Hospital and Tan Tock Seng Hospital; and has recently completed a three-year, multi-center clinical study involving more than 5,000 matched control and stomach cancer subjects. These collaborations with DxD Hub and other ecosystem players have been crucial for the successful launch of this product in regional markets. With the injection of funds, Ark will be scaling up multi-centre clinical studies focused on early cancer detection. Ark has already set in motion a plan to launch Asia’s largest clinical study that aims to enroll 50,000 participants through partnerships with local governments and medical institutions. The funds will also be used to develop and launch new blood tests for early detection of other high prevalence cancers such as lung, breast and colon cancer. 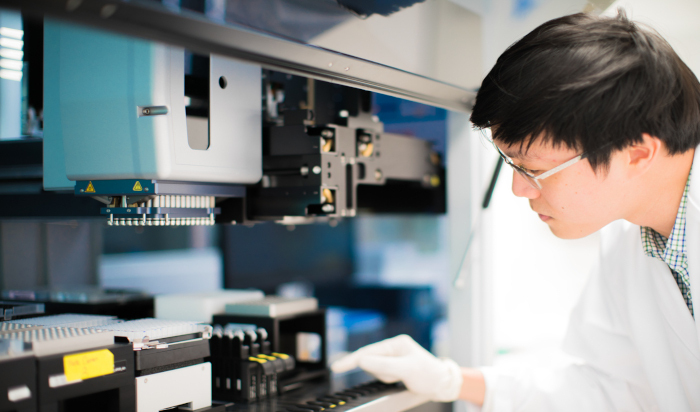 Last month, Roche announced the launch of FoundationOne CDx, Foundation Medicine’s comprehensive companion diagnostic test for personalised cancer care in Singapore. FoundationOne CDx supports clinicians in their decision-making by providing a clear, in-depth report that describes the unique genomic profile of a patient’s tumour as well as associated, approved therapies and relevant clinical trials.